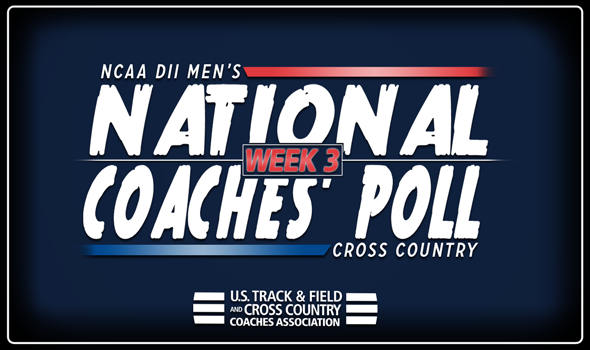 NEW ORLEANS – After one of the biggest weekends in the collegiate cross country season, there was finally movement in the latest edition of the NCAA Division II Men’s Cross Country National Coaches’ Poll released by the U.S. Track & Field and Cross Country Coaches’ Association (USTFCCCA) on Wednesday. In total 18 of the previous top-25 teams saw change in this week’s poll and while a new No. 1 was not crowned, seven of the top-10 teams experienced movement. The No. 1 spot in the country remained with Adams State after it once again received all eight first place votes. The Grizzlies placed third as a team at the Stanford Invitational this past weekend and were led by Sydney Gidabuday, who finished second overall and was named National Athlete of the Week. Adams State scored 75 points in Palo Alto, California, and finished higher in the team standings than numerous NCAA Division I programs. The only teams that beat them at the meet was NCAA DI nationally-ranked No. 5 Stanford and No. 25 UCLA. This is the fourth consecutive week that Adams State has unanimously been selected for the top spot. Improving one spot into a tie for No. 2 is Grand Valley State. The Lakers are fresh off a win at the Loyola Lakefront Invitational, in which they placed all five of their scoring athletes in the top-25. Zach Panning led the charge as he collected the meet’s individual title. Remaining at No. 2, albeit this time in a tie, is Colorado Mines which has been off from competition since a win at the Colorado College Invitational in early September. They will meet Mountain Region rival and current top-ranked Adams State in their next meet at the Fort Hays State Tiger Open on October 13. Jumping up one to No. 4 is Chico State after winning the Capital Cross Challenge for the third-straight year. Eddie King paced the way for the Wildcats with a fourth-place finish. It was the first race of the season for Chico State. Dropping one but remaining in the top-five is No. 5 Western State who was off from competition this past weekend. The Mountaineers won its Mountaineer/Cowboy Classic their last time out and will race again at the Lewis University Conference Cross-Over on October 6. Augustana (S.D.) held in the No. 6 spot in the poll after the program won the Maroon Division III race at the Roy Griak Invitational over the weekend. Nathan Schroeder led the way with a fifth-place finish. No. 7 CSU-Pueblo, No. 8 Southern Indiana, No. 9 Mount Olive and No. 10 Western Oregon all improved one spot from the previous poll. CSU-Pueblo was off from competition this past weekend while Southern Indiana finished 22nd out of 45 teams in the blue race at the Louisville Classic, Mount Olive took 16th out of 41 teams at the Paul Short Run Invitational and Western Oregon sent a small batch of athletes to run at the Charles Bowles Willameete Invite. The largest gain in the poll belonged to a four-spot improvement by No. 20 Cal Poly Pomona after a fifth-place finish at the Capital Cross Challenge. The only new team to join the top-25 was No. 25 Embry-Riddle (Fla.) after receiving votes in the previous poll. It is the first time Embry-Riddle (Fla.) has been ranked in program history. Western Washington, West Texas A&M, Cedarville and Augusta also received votes.